There are scenarios where you want to forward calls to a service to another service based on its contents, the action invoked, the address, or etc. This example demonstrates how you can forward all calls coming to, let’s say Service1, to Service2. In this scenario the Service1 will be router which forwards all requests to Service2. The interface contains a simple operation where clients will use. 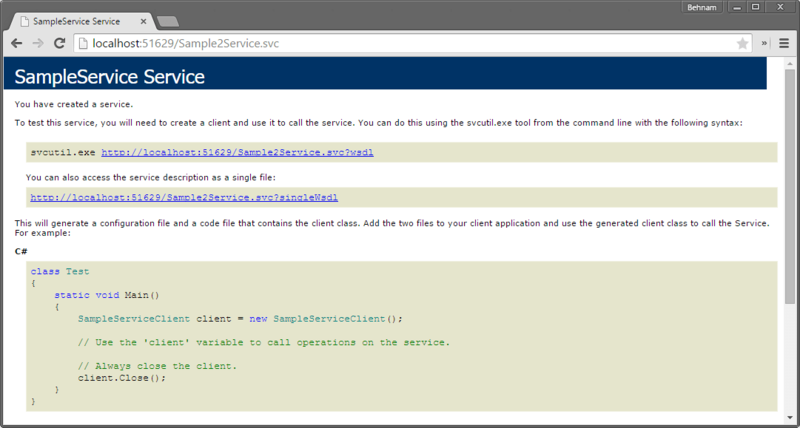 Create another C# Class Library and add the following class which is the service implementation of ISampleService. The implementation of SampleOperation is returning a simple string message. 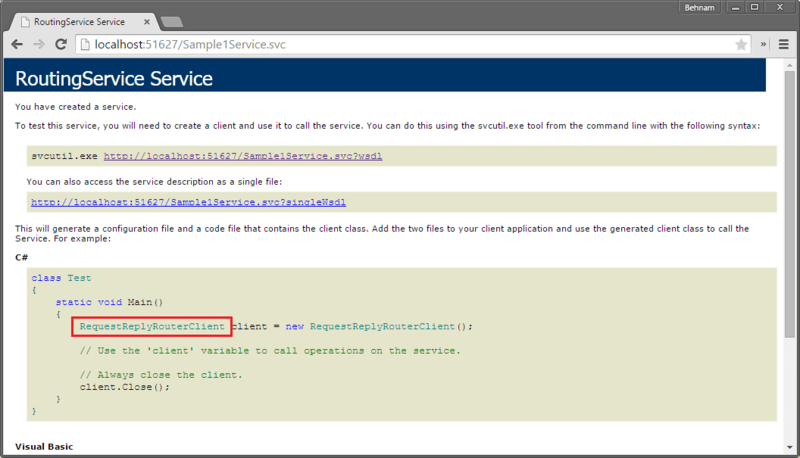 Create an empty Web Application in order to host the Sample Service. Add the following references. This configuration is defining the service endpoint to be used by a client application. Run the web application and browse the service address in the browser. 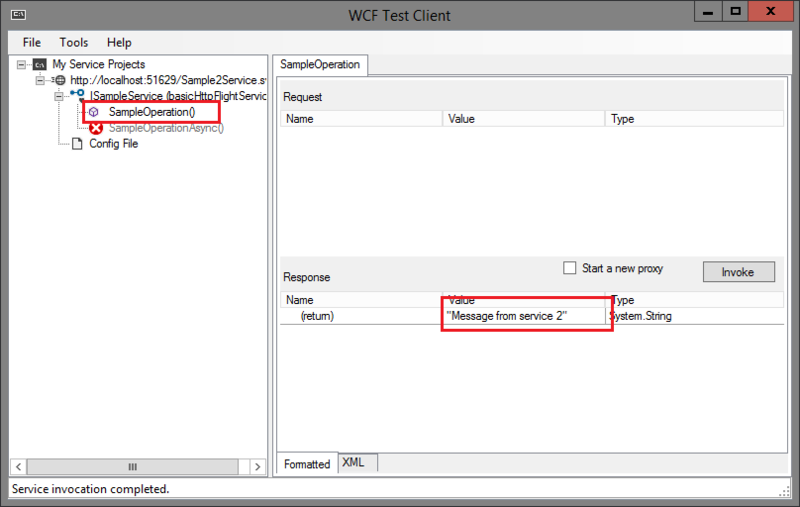 Open wcftestclient.exe add the service address. You can see by invoking the SampleService operation we have got the expected message. Create a new empty Web Application. 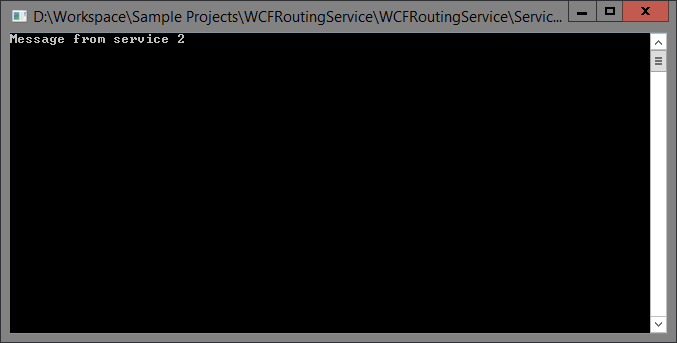 This web application will be the Routing Service Host. The only thing you need to do is to modify the web.config and add the Routing Configurations. Take note that the service attribute under serviceActiovation node is used to host System.ServiceModel.Routing.RoutingService and is fully qualified it. The service endpoint and service endpoint contract are System.ServiceModel.Routing.RoutingService and System.ServiceModel.Routing.IRequestReplyRouter respectively. In the behaviors section make sure you set the httpGetEnabled attribute to true under serviceMetadata. The routing section defines the routing filter collection name. The routing section is defining the Message Filters. The messages will be forwarded to another service based on the filters defines here. In this sample the MatchAll filter type is used which match all the messages. Run the Routing Service web application and browse the service address in the browser. Notice the service of type IRequestReplyRouter. Take note that the endpoint contract is Common.ISampleService. Take note of the type ChannelFactory is initiated with, is of ISampleService, as opposed to the type the Routing Service is actually created on, which was IRequestReplyRouter. You can see the call to the Routing Service forwarded to the Service2.